It's All My Blog: Could Android 4.0 facial recognition be beaten with a photo? According to TechSpot, a Google spokesperson claimed that the Face Unlock feature in Android 4.0 "could" be used by simply using a photo of the pre-registered owner of the smartphone. However, this claim has been refuted by Tim Bray, who works on the Android operating system at Google. Responding to a Twitter message from someone who say Face Unlock could be hacked in this manner, Bray said, "Nope. Give us some credit." We are more than willing to give Bray and the rest of the Android 4.0 team the benefit of the doubt in terms of this new feature working the way they say it works. But we question the need for such a advanced feature in the first place... what happens if you are in a dark space and want to unlock your smartphone? TechSpot's report said that during the big Android 4.0 press event last week, the phone of Matias Duarte, the head of Google's user experience, had issues identifying him with the Face Unlock feature. It may have been due to the poor light during the event. 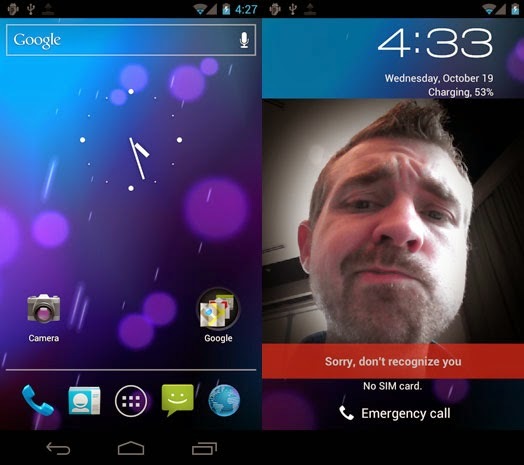 In any case, we will know for certain when the first Android 4.0 smartphone, the Galaxy Nexus, is released sometime in November.